Last weekend we got our tree & decorations up, and the stump works perfectly. Q salvaged it from a huge piece of lumber at his parent's house. We brought it home (it's super heavy, by the way), and he drilled a hole in it and added a few coats of varnish. We set it on a piece of protective cardboard and then wrapped faux sheepskin rugs over top. If the tree looks crooked in these photos - that's just because it is. 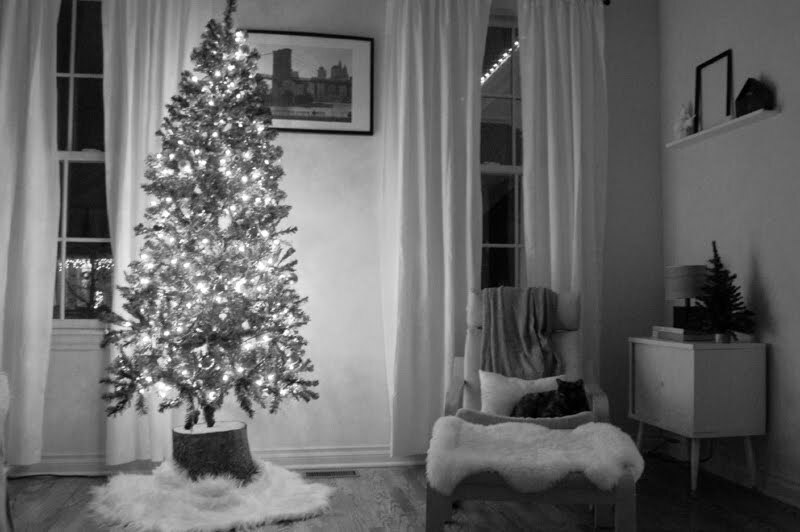 After putting it up, I also realized a 7 foot tree looks tiny in our living room! And I miss the smell of a big, real tree. So next year we might try a real one again, and put this one upstairs. 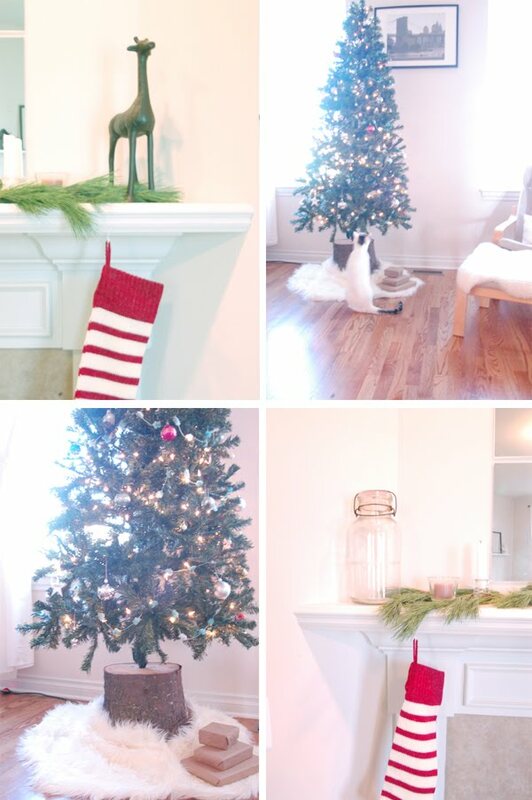 I guess I'm becoming that lady who has multiple trees (and cats). Have a lovely weekend. Totally love how you decorated the tree! And the stump idea is brilliant. Our stand always is too flimsy (why do they make them out of plastic anyways??) and the tree ends up on the floor. I'll have to see if we can do this this year! Angie said it looks nice with the bark left on - I think I do to! What a cute idea to use the stump! I know when I get a house I'm going to be "that lady" with multiple trees, I'll even have one in my room! my2fish: thanks t+a! I also agree - glad we left it as-is. What a great idea! I'd like to be the lady with multiple trees too. We're very festive at our house. We've got 6 advent calendars this year!!! Thanks for the link to peppermint bark. It's a holiday favourite of mine. So pretty! Love the stocking! Very cool. Love the tree skirt. Mine is obnoxiously red:) Might need a new one. sigh. I love the holidays :-) Your living room looks great! I can't wait to get ours up! I love the rugs tucked around the bottom - makes it look so cosy! Although your cat in the first picture looks like it might be working out a way to scale it!! Your tree looks beautiful in that stump, but I was going to ask how you keep it watered, but now I know, you don't have to. It looks good anyway and so does your chair next to it with the sheepskin. Looks like a nice place to sit and watch the tree lights twinkle. Have a great weekend. The stump...what an outstanding idea!! Love it! thanks for all of your thoughtful comments! i am so smitten for these photos. so whimsical + lovely! i love the stump! i wanted to do that too, but i swear there are no stump in arizona. what cozy christmas decor!!! i love it! where did you get the undertree 'skirt'? yayyy for putting up your tree!! i just love seeing other trees!! we unfortunately won't be in town for much of this month so don't have time to put one up! we did just put up lights around our window though haha!! this is amazing - love the added touch of the cozy sheepskin rugs! i am in love with the stump!! it turned out perfectly!! your home is just so cute, Alli. merry Christmas! 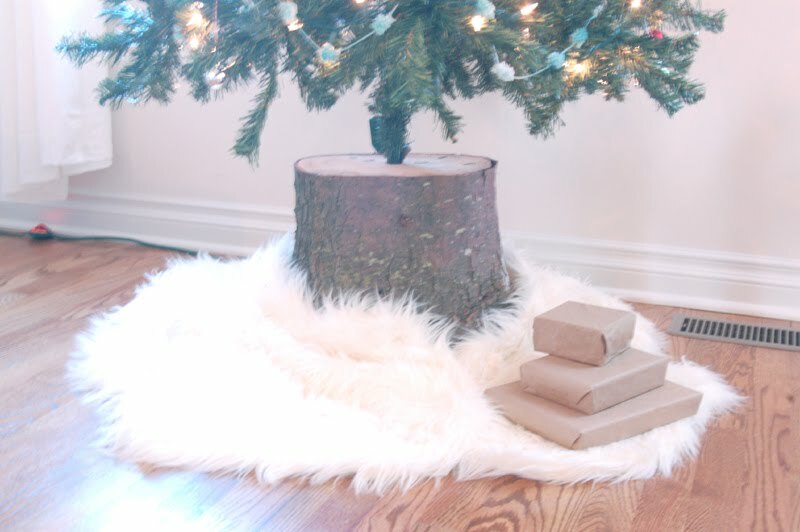 Hi Kélé - our tree "skirt" is actually two faux sheepskin rugs (they're from Ikea!). Aw - that stump is so sweet! Ohmygoodness, I just love your decorations. I love the stump too - I dont think I've ever said that about a 'stump' before! Haha, but really it's fantastic.